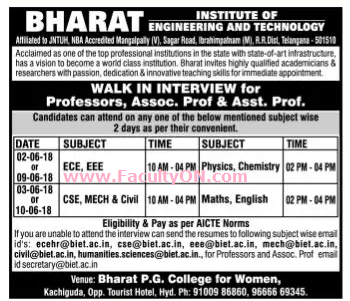 Bharat Institute of Engineering and Technology, Hyderabad has advertised in the SAKSHI newspaper for recruitment of Teaching Faculty- Professor / Associate Professor / Assistant Professor jobs vacancies. Interested and eligible job aspirants are requested to walk-in on 02nd, 03rd, 09th and 10th June 2018. Check out further more details below. About College: The Institute is approved by All India Council for Technical Education (AICTE), New Delhi and affiliated to Jawaharlal Nehru Technological University Hyderabad (JNTUH), Hyderabad. The Institute is known for its quality initiatives which are reflected in accreditation by NBA. Many eminent academicians and dignitaries who visited the Institute have acclaimed the quality of education imparted in the Institute and appreciated its achievements since its inception. How to Apply: Interested and eligible candidates are requested to attend the Walk-in interview along with CV, all originals & copies of certificates / testimonials and recent PP size photos at the walk-in address mentioned below. Those who are not able to attend the interview can send applications to the email address mentioned here.